BeautiGoddess Lash Studio is a premiere Eyelash Lift Service on Oahu - Honolulu, Hawaii. Lash lifting is an affordable alternative to lash extensions. We also offer lash and brow darkening, facias, waxing, wellness services and more. 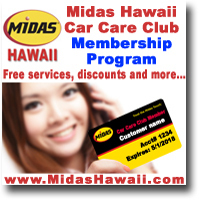 Midas Hawaii Car Care Club program is our exclusive membership program. This program is a great way for customers to save money, get free services, get priority support, special offers, a membership card and more..
Waikiki Condos for sale. View interactive geographical map of hundreds of Waikiki Condos for Sale. Photos, description, and much more. A capital improvement project to provide protection against cliff erosion and rock slides along two portions of the Diamond Head area, L ahi, is scheduled to begin on Monday. The City and County of Honolulu's Department of Transportation Services (DTS) will increase parking meter rates island-wide on Monday, Feb. 11. Pursuant to Ordinance 17-25 , previously approved by the City Council in June 2017, newly-implemented rates will take effect at on-street parking meters only. Dull, tired skin? Highly technical, we offer a variety of anti-aging treatments to bring out the skins natural glow. We use YonKa Paris Facial products to provide your skin with vitamins and quickly find your glow. City and County of Honolulu offices will be closed on Monday, Feb. 18, in observance of Presidents Day. Today, the city launched Honolulu Dashboard, a quick and easy way to review progress on key city services and issues. A beta test version of the dashboard has been online since December, providing the opportunity for city staff to offer input and feedback. Under a recent agreement between plaintiffs Jim McConnell and Mark Edwards and the City and County of Honolulu, the parties have agreed to close out the 1997 federal consent decree that addressed street and sidewalk accessibility under the Americans with Disabilities Act, or ADA, which was passed by the U.S. Congress in 1990. The City and County of Honolulu Department of Parks and Recreation proudly announces the candidates for the 91st Annual Lei Court selection event.